Through decades, Maynard's Boy Scout Troop #130 has conducted numerous Eagle Scout Service Projects to improve outdoor recreational opportunities in Maynard. These include creating and improving the town's Summer Hill and Assabet River Walk Trails, work at the Assabet River National Wildlife Refuge and on the Assabet River Rail Trail, and clearing the Marble Farm historic site. To earn the Eagle Scout rank, the highest advancement rank in Scouting, a Boy Scout must fulfill requirements in the areas of leadership, service, and outdoor skills. Although many options are available to demonstrate proficiency in these areas, a number of specific skills are required to advance through the ranks: Scout, Tenderfoot, Second Class, First Class, Star, Life, and Eagle. Scouts must pass specific tests that are organized by requirements and merit badges. The top three ranks require community service projects. Approximately five percent of Boy Scouts reach Eagle Scout. 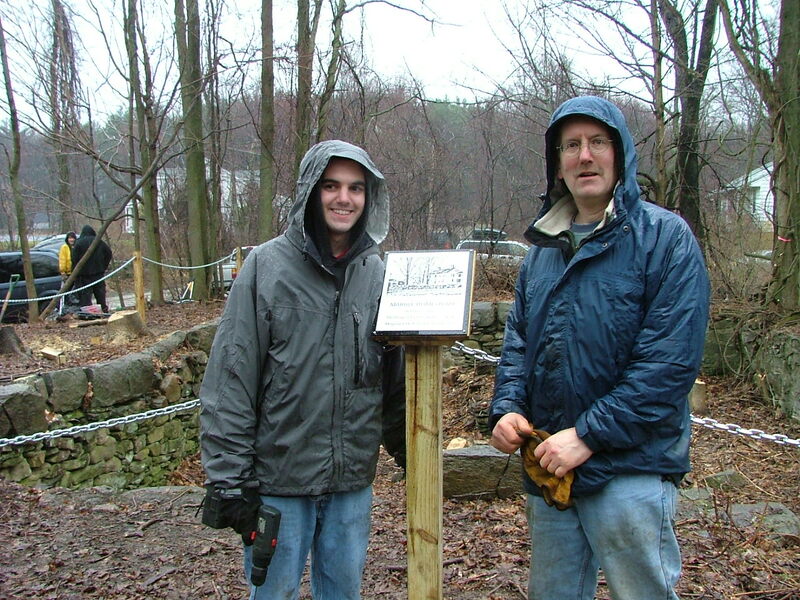 On April 4, 2009, Maynard Boy Scout Troop 130 spent the better part of a damp spring day cutting down trees and clearing brush from the Marble Farm site, next to Rockland Avenue, and erecting a post and chain fence bordering two sides of the foundation. This was an Eagle Scout project by Jason Schomacker. A plaque on one of the fence posts shows a photo of the house, with barns and other outbuildings seen in the background. The Marble family had moved to this site circa 1710. Their descendants (Marble, then Whitney, then Parmenter) owned it through 1924, when the house was destroyed by fire. The site has the potential for being an interesting addition to Maynard’s history, but without periodic maintenance it gets rapidly overgrown. Boy Scouts on completed bridge. Jakob Dickson at left end. This year, on September 19, 2015, the Troop spent a warm fall morning under the aegis of Eagle Scout candidate Jakob Dickson, carrying lumber a quarter mile into the woods and then building a bridge over a creek. Funding was provided by the Town of Maynard, courtesy of the Conservation Commission. All the pressure-treated lumber was pre-cut and delivered to the trail head by Butler Lumber. The finished bridge spans sixteen feet and is 3.5 feet wide. The two beams are each three 2x8 by 16 foot long, nailed together. The Assabet River Walk Trail has signed entrances from the cul-de-sac at the end of Colbert Avenue and on Concord Street. From Colbert, the Trail can be very wet, and is also too root-ridden, root-riven and root-rampant to be managed on an off-road bicycle. From Concord Street the first half of the trail is walkable and rideable, then progressively wilder after the bridge crossing. Just before the bridge there is an option to head farther east. This alternative route leads to good views of the Assabet River. The river here is still water (not moving) because it is backed up behind a dam next to Route 62, in Acton. All parts of trial are marked with white blazed painted on trees. Not in the newspaper article: The land is shown on town maps as town land, designated either Lemoine Land or Colbert Hill. There was a Fred Lemoine who served in World War I and an Edward Lemoine listed as donating to the Collection at St. Bridget's Church, November 1907. One end of the Trail is to Colbert Avenue, named for Eugene Colbert's family who lived nearby on Glendale Street starting around 1879. His son Daniel Colbert identified as a founding member of the Twilight Club (1904) a social organization that had a cottage on Lake Boon. But there are no Historical Society details on why these two names are associated with this plot of land. There are remnants of stone walls and drainage ditches crossed by the Trail, suggesting this was pasture. Recent wildlife sightings in the area include several deer and a rafter of turkeys. (Venery, the proper naming of animal groups, declares that turkeys in plural are a rafter in the same way that geese grouped are a gaggle if on the ground but a skein if aflight.) The River Walk also introduces visitors to native and invasive plant species. Natives includes numerous beech trees, identified by smooth grey bark, and also poison ivy. Invasives include Japanese knotweed at the Colbert end, Japanese barberry at the Concord end, garlic mustard, burning bush, multiflora rose and Oriental bittersweet throughout. These dominate the forest understory because they are all plants deer disdain to eat. Anyone interested in learning more about Troop #130's activities should visit http://web.maynard.ma.us/troop130. This website provides a description and history of the Troop, including past Eagle Scout projects. The Troop is chartered with the Boy Scouts of America and sponsored by the Union Congregational Church. Scouting in Maynard dates back to 1927. Going forward, there were years with no troop, one troop or two troops (#1 and #30). The two merged at the close of 1984 to form Troop #130, which continues to this day. Girl Scouts also have an active presence in Maynard, as part of Girl Scouts of Eastern Massachusetts. Earlier this year Rachel Hahn earned her Girl Scout Gold Award - the highest level, requiring 80 hours of toward a community service project - for creating a website, informational brochure and events about autism inclusion resources.